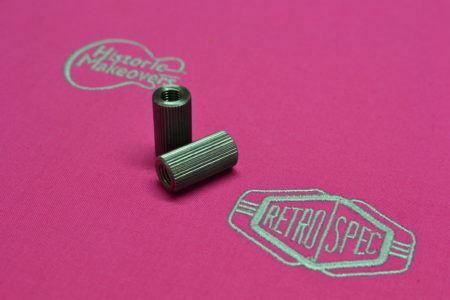 Set of two Les Paul steel stop tailpiece bushings. For vintage Gibson Les Pauls, the holes will accept vintage length bushings. 2012 and earlier Gibson Historic Les Pauls are not drilled as deeply and require Historic length bushings. You can drill out your Historic if you want to use vintage length bushings. In 2013 Gibson started drilling Historics deeper for vintage length bushings and studs. Measure to be sure before ordering.